In this bio, I’m going to tell you a lot about myself because I want you to feel like you are having coffee with a friend when you visit EWC. Additionally, I am skeptical of websites where you look at the “about” page and there is only an impersonal, canned blurb there, or maybe nothing at all. Who are these people? Why should I trust them with my time? I know my bio here is unconventionally long, but adhering to “convention” has never been one of my strong suits, so please feel free to step off the “Dr. Lynda Story” at any time. Really, this is far too long, but it is the whole story and I’m an ordinary person who has found her way in and out of a lot of extraordinary circumstances. Fortunately, my mother, a nurse and a survivor of a calamitous childhood, encouraged every creative impulse I had. And my father, an old-fashion family doctor/surgeon, never thought of anything in terms of what he couldn’t do. Anything was possible. For my part, I suspect I came into this world with an imagination on over-drive. It was all a lucky combination. I grew up in a small, farming town in central Illinois where endless, flat, expanses of corn and soybean stretched to every horizon. That one-dimensional world invited us to look at play like a giant game of Shoots and Ladders for largely unsupervised children. I’m so thankful that my childhood memories are filled with things like building dangerously high tree houses all on our own, and riding bicycles like the wind on unfinished stretches of highway. 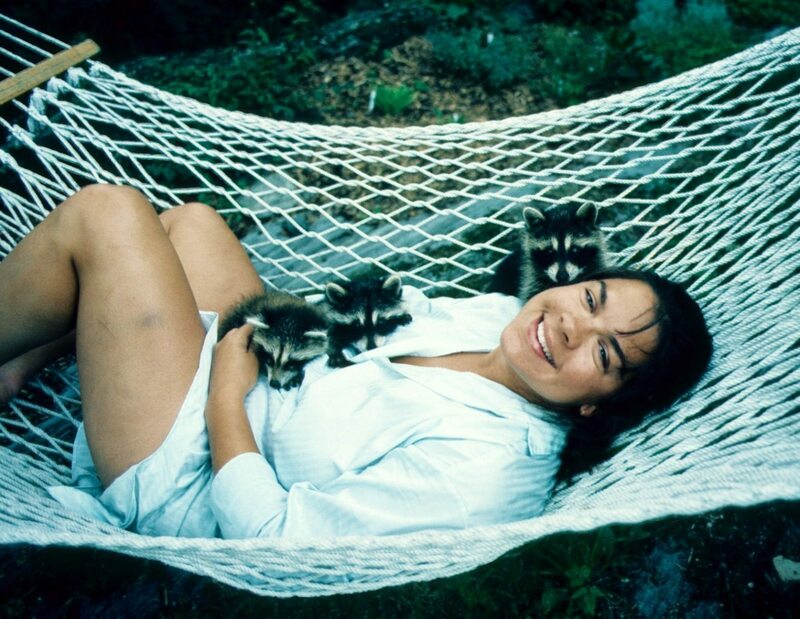 I was allowed to raise orphaned raccoons in my bedroom, wear elaborate jewelry I had made from colorful bottle caps, and ride dangerously wild horses to far off hamlets. I was paid to paint humorous murals in hospitals and rewarded for extravagant science fair projects about the then recently discovered galaxies. The only reality check was that most of us had to be home by the time the porch or street lights came on. Things were far from perfect in our home, but both of my parents modeled a fierce defense of the “goodness” in others. Every horizontal surface in our home was covered with National Geographic magazines and they leaned on them for evidence that the wider world was nothing to fear. And then something dreadful happened. A single, life-changing tragedy ended all that carefree wonder. When others were worrying about driver’s ed and collecting ID Bracelets, I was forced to manage the meaning of life, alone, and far too early. I’m not going to go into the tragedy that changed my life except to say that at the age of fifteen, my parents woke me one morning to tell me that my best friend’s family had perished in a horrific way. Innocence lost. I had glimpsed the darkest side of humanity, too early. It happened that my best little friend had survived, but my worldview did not. I never took another day for granted. I reveled in seeking goodness around me and demanded it when it was unnecessarily missing. My goals began to include an urgent sense of curiosity, connection with others and gratitude that became my greatest gifts. My husband (who we will affectionately refer to as Dr. Chuck on this website) and I have been together since we were 14-years-old. Yes, you read that right. It’s cute, but we are a couple of “survivors” (Dr. Chuck has his own story of an early, life-changing trauma) who were lucky enough to meet early, cling to each other while trying to make sense of darkness, and somehow kept making each other better people, through 37 years together. 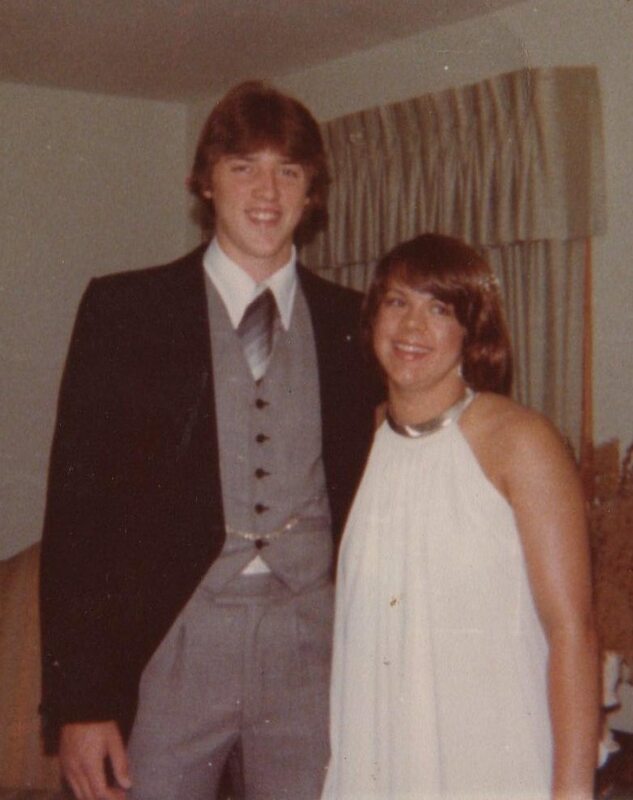 The wider-world adventures in our life started with my husband’s basketball career at the University of Kentucky, where we were suddenly forced to find a place for intense pressure, money, and fame in our understanding of goodness. Much of what we experienced in the big leagues, at the highest level of college basketball, was amazing and some experiences were crushing. Chuck eventually became captain at Kentucky and was drafted by the Chicago Bulls in 1982, but we didn’t even open the letter with the contract. Instead, we launched out into the world with Chuck’s professional basketball career in Europe. This began our life of living and traveling off-the-beaten-path all around the globe. We turned my comfort with risk-taking, and sense of wonder, into a lifetime of making counter-intuitive choices. We have lived abroad twice: first in Spain and then in Italy, where we went to practice dentistry. We acquired Irish passports and dual citizenship and ever since, we have considered ourselves citizens of the wider world. 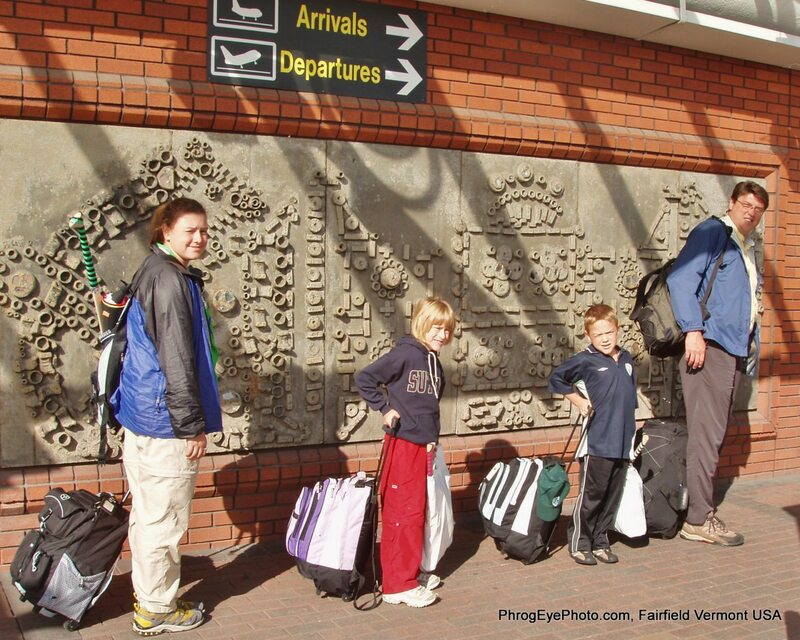 Eventually, we returned to the U.S. and decided to put down roots in Northern Vermont, where we’ve raised three independent and worldly kids who started traveling to the world’s backwaters with us as soon as they could carry their own backpacks (age 6). They have played with meerkats in the Kalahari Desert and been lost in the Andes Mountains with us. They’ve curled up on wooden planks to sleep in remote corners of Tibet, climbed through castle ruins in Slovenia, and squirreled around at our feet in passages at the IRA Headquarters in Belfast, Northern Ireland. All the while, their father and I were making friends. Many truly good and generous people have graced our adventures. Our hope is that our children will use their experiences to make the world a better place in their own way some day. Ever Widening Circles also seems the logical outcome life spent experiencing the wonder and diversity of the human condition around the planet too. I brought my love of the natural world right from childhood through to the homelife Chuck and I created for our family. 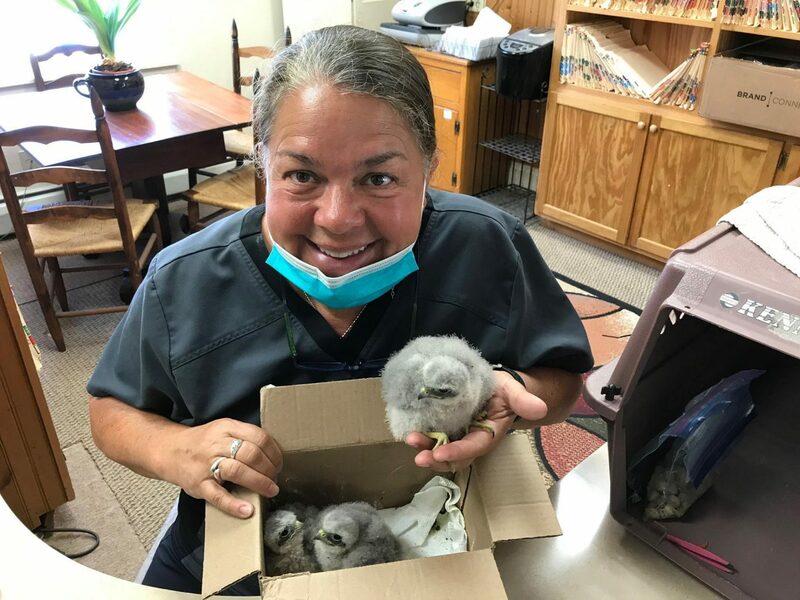 For many years, we were the only people in Vermont licensed to raise orphaned moose and large animals for the Vermont Fish and Wildlife Department. We raised and released a dozen orphaned animals every summer: fawns, foxes, porcupines, skunks, raccoons, seagulls, and the list goes on. Our kids grew up thinking everyone had injured wildlife being nursed back to health on the kitchen counter. 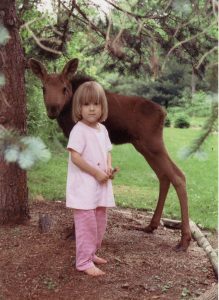 The photo is our daughter Louisa, age 4, with an orphaned moose we named Clifford. We found him a great home at the Milwaukee Zoo and eventually became the oldest living moose in captivity. I am also an artist/welder. 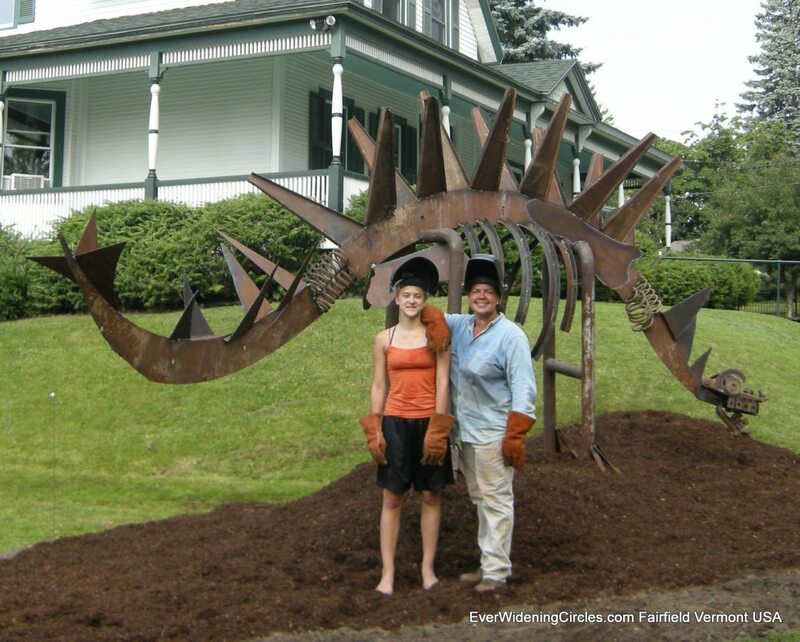 For the last 25 years, I have been welding gigantic sculptures with scrap metal from local junkyards to create unusual figures of people, animals, and even a life-sized T-Rex skeleton for our front yard at home. A life-sized stegosaurus in the front yard of our office has become a local landmark. And my daughter and I have big plans for a life-sized Pterodactyl that we have collaborated on, and that crouches menacingly in our front yard. Our greatest teacher – our daughter Louisa – was born four and a half months early, weighing a little more than one pound. 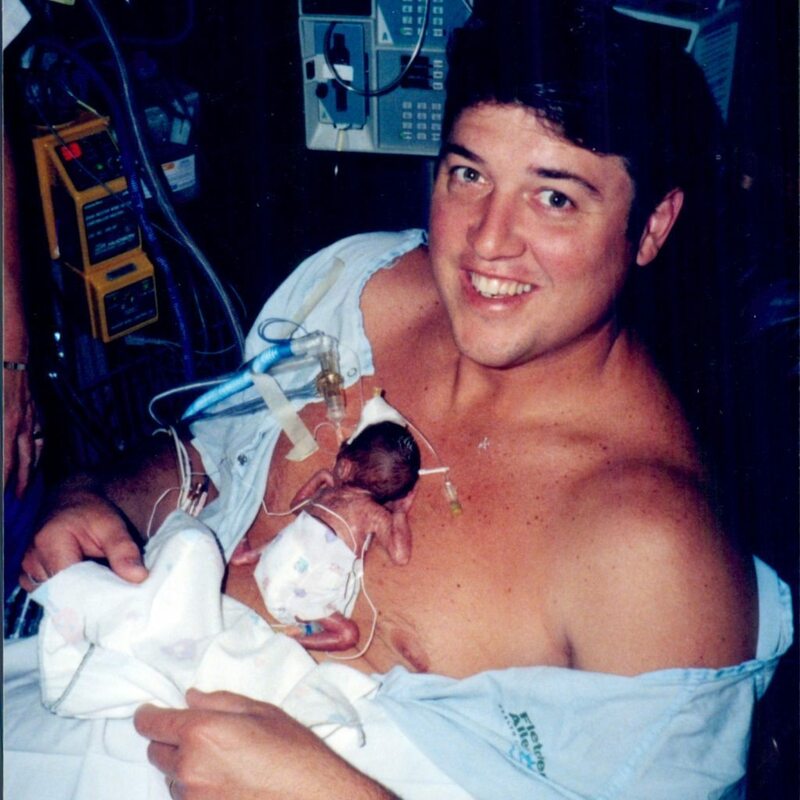 Here’s a photo with her on Dr. Chuck’s chest at only ten days old. Her tiny diaper – too big for her – was just a bit bigger than a playing card folded in half! Living with a child on death’s doorstep for many months teaches you to manage your perspectives with the agility of a ninja, and for that reason, Chuck and I tend to look at every rough patch as a problem to be solved. Miraculously, Louisa did survive and grew up to have absolutely no sign of her rocky start. 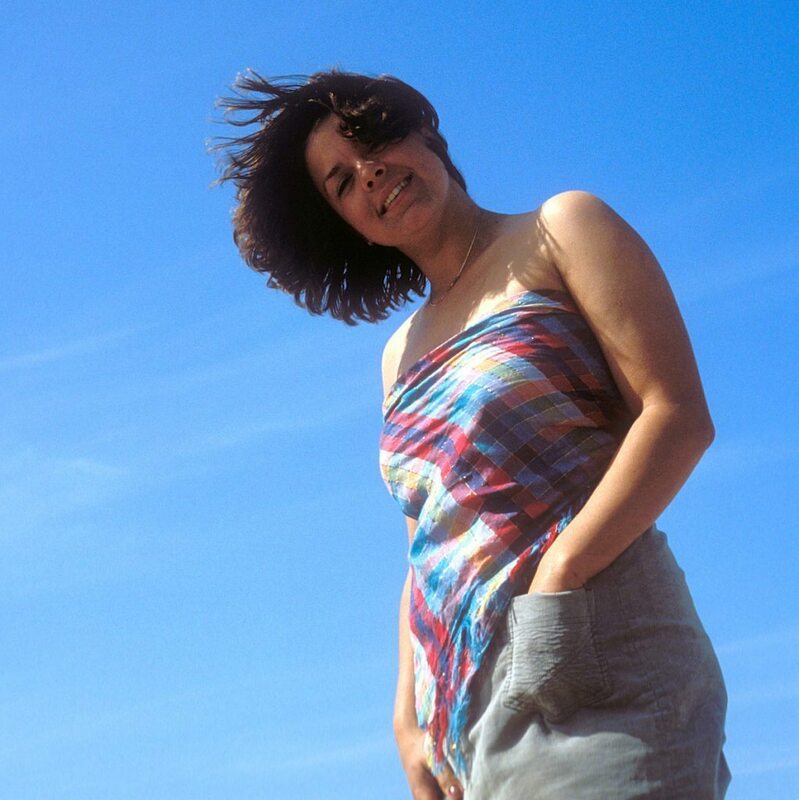 She graduated high school with a provisional patent on an entirely new kind of wind turbine, is convinced that she is here for a reason, and acts like it. The experience inspired a more introspective angle in my life. With a growing young family, I decided that if I could not investigate everything for myself, then I would read about it. I’ve read everything from the New York Times bestseller list of business book, to books by astronomer/philosopher, Carl Sagan. My bedside table is stacked with books about neuroscience, engineering, geology, and biographies too numerous to count. And along the way, Dr. Chuck and I have managed our large dental practice with special attention to making sure we have kept the humanity in healthcare. We love people and never a day goes by that we don’t share laughter, tears, or hugs with patients who feel like family. I will never be able to give back as much wisdom as my patients have given me. And that brings us brings us back to the goodness of people, the very best thing that my parents instilled in me. Good people still leave orphaned wildlife on the back porch at Fiddlehead Dental, our dental practice. And almost every day, someone shares how Ever Widening Circles has inspired them to lead lives that make the world a better place. And Ever Widening Circles seems a logical outcome of a life spent honing instincts like curiosity, risk-taking, compassion, and creativity. If you give me an answer, it only helps me ask a better question next. Let’s celebrate wonder and ask better questions together! Now here’s a TED Talk that is both fun and transformational! The best ideas are a win/win for everyone and this one certainly qualifies. After this, you’ll never look at your “stuff” in the same way. Down the Hatch! But Now What? When Mt. Vesuvius erupted, an entire society was preserved in moments. This is the kind of story that brings us some truly amazing insights and silver linings, especially when two very smart people, some ancient scrolls, and particle accelerator are involved. What if there is an almost magical world of symmetry behind a curtain of knowledge that only some people decide to pull back? Here’s a small window into a world full of wonder and precious imperfections! The Amazing “Year of the Quad” in the Olympics! 2018 is said to be the “Year of the Quad” in the Olympics, but what does this mean? Why is landing a quad a big deal? Here’s the science and math behind a nearly impossible feat.